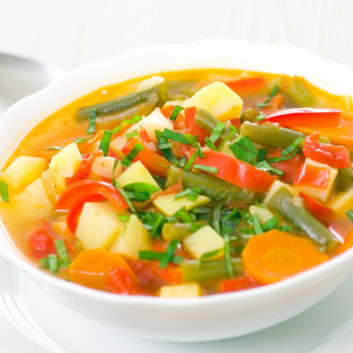 Starting your dinner with a veggie-filled soup can help take the edge off hunger and curb overeating during your meal. Try this tasty bowl to kick off your dinner. In a large, nonstick stock pot coated with cooking spray, sauté 4 teaspoons minced garlic, 1 cup diced onion and 8 ounces sliced mushrooms over medium heat for 10 minutes, or until tender. Add 8 cups low-sodium chicken or vegetable stock, 1 cup sliced carrots, 2 cups diced zucchini, 1 cup chopped green beans, 2 cups chopped cauliflower florets, 3 cups roughly chopped cabage, 1 can (15 ounces) no-salt-added diced tomatoes and 3 bay leaves. If using Spicy Creole or Italian, add to pot now. Bring to a boil, cover and simmer over low heat for 20 minutes. Add 2 tablespoons red wine vinegar (or balsamic vinegar) and cook for an additional 2 minutes. If you’ve chosen the Garden Herbs seasoning blend, add it now. Remove the bay leaves before serving or freezing.